While there was no such thing as a watch in Medieval or Renaissance times, today one is required to be at certain places at certain times. We have found the solution! Looks like a mug strap, but can be opened up and read while attached to your belt. 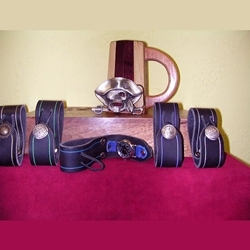 Available in either black or brown leather and a variety of colored etching to compliment your costume. The battery powered watch can easily be serviced.